We provide a full range of interior decorating services, including refurbishment of existing decor or full room / house redecorating. Whether you want to brighten up a kitchen with a new coat of paint or restyle a dinning room with a full new image we can help you, providing advice, colour charts and sourcing materials as required. Interior decorating can be a great way to makeover a room either for "just for a change" perhaps, or to give a room a new contemporary look, restyling with a feature wallpapered wall or complimenting paint colour schemes maybe. Sometimes interior decorating is an essential, if for example damage has been caused via a water stain, children or pet damage, a room may need decorating to bring it back to its former glory! 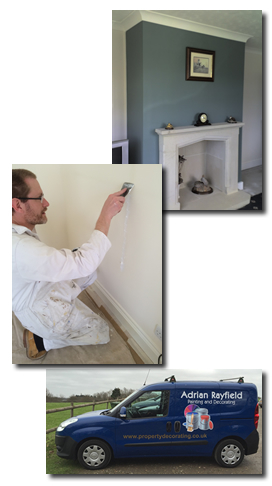 No job too small - from having the hall landing and stairs wallpapered to having a utility room painted we provide the service to suit your needs. Professional wallpaper hanging. All paper types from lining paper to specialist papers. All types of painting, staining and varnishing to quality standard. Clean and friendly service. We even bring our own vacuum cleaner and clean up after ourselves! As a Southend based business we cover the surrounding Southend area from Wakering and Barling to Thorpe Bay and Shoeburyness - from Southchurch and Prittlewell to Rochford and Hockley. Contact us to arrange an onsite visit for a estimate. You can complete our online estimate form or call us on 0845 0037 508.